You can create a CloudWatch alarm that monitors CloudWatch metrics for one of your instances. CloudWatch will automatically send you a notification when the metric reaches a threshold you specify. You can create a CloudWatch alarm using the Amazon EC2 console, or using the more advanced options provided by the CloudWatch console. 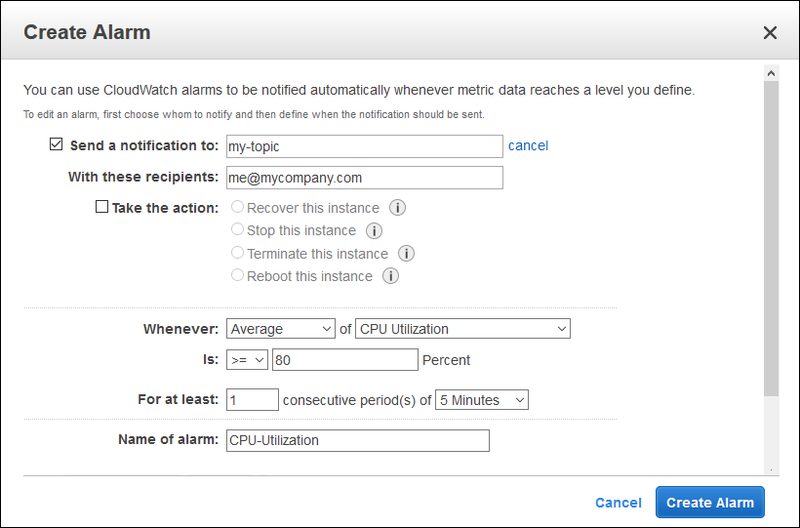 For examples, see Creating Amazon CloudWatch Alarms in the Amazon CloudWatch User Guide. On the Monitoring tab, choose Create Alarm. Choose create topic. For Send a notification to, enter a name for the SNS topic. For With these recipients, enter one or more email addresses to receive notification. Specify the metric and the criteria for the policy. For example, you can leave the default settings for Whenever (Average of CPU Utilization). For Is, choose >= and enter 80 percent. For For at least, enter 1 consecutive period of 5 Minutes.